We have some winners from last week's posts. 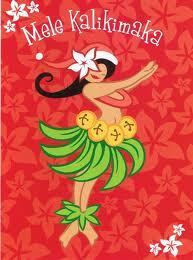 - Box of Hawaiian candy from me: Danielle G.
Check out the ongoing "12 Days of Christmas - Hawaiian Style." Comments for all posts are open through January 6. I'll randomly select winners on January 7 and mail prizes NLT January 10. Mary and I are giving away over 30 books plus Hawaiian trinkets. During my flight from Honolulu, I read an article in People, "On location with Hawaii Five O - A guide to some fave Aloha State tourist spots from the producer of the CBS Hit." On screen: The Aloha Tower was featured in a recent chase scene. History: It is the original marketplace for incoming cruise and cargo ships. Tourist Attraction: Perhaps a few tourists from the cruise ships walk over to the Aloha Tower, but I don't know many locals who do (although Hawaii Five O held a casting call at the marketplace). Most tourists stay in hotels on Waikiki Beach without cars. The Aloha Tower is a long walk. Alternate shopping: The best place for tourists to shop for Hawaiian items is Hilo Hattie's. There are a few smaller stores near Waikiki Beach and tourists can take its shuttle bus to the larger store on Nimitz Avenue (between the docks and airport). 2. Diamond Head Crater, http://www.hawaiistateparks.org/. On Screen: It is a distinctive landmark in almost any production filmed in Hawaii. Tourist Attraction: Yes, it is worth the visit to hike up the crater walls and overlook the Pacific Ocean. 3. Surfing school. The article hints that one surfing school will be featured in future episodes. But let's talk about a surfing school connected to romance books - Ty Gurney's Surf School. Ty advised Jane Porter when she researched her book, Flirting with Forty. Jane posted her own Hawaii favorites on website. 2. Make sure I know how to contact you - send your email to sos.america@yahoo.com. 3. Comments will be open through Friday, December 17 for the giveaway. 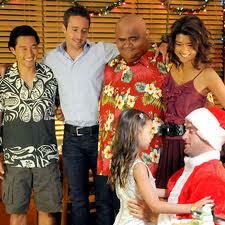 I will mail the gift set on Monday, December 20 from Hawaii. George is married to NYT's bestselling author Bertrice Small. My mother, Ruth Cramer-Zimmerman, was married to Jack Zimmerman, pharmacist mate 1st class, USN. 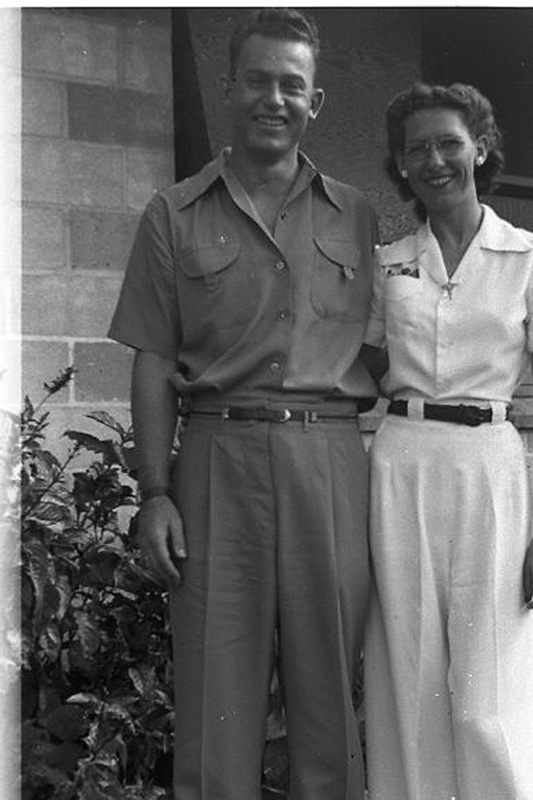 She worked on Ford Island as a secretary/civilian. 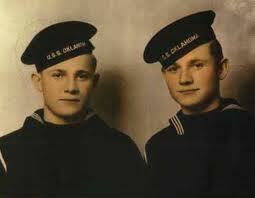 Jack was assigned to USN but not on a ship. They both experienced Pearl Harbor. They lived in base housing above Pearl Harbor. When the attack hit, my mother said Japanese planes were flying right over the base housing. They took for cover and she said that there was a bullet hole through their bedroom. Luckily, neither she nor Jack were harmed. When I asked her what it was like, she said two days after the attack, she had to take a boat across the area to Ford Island to work. The odors were awful and she became very grim and couldn't say much more. She remained on Ford Island and eventually, all civilian wives of USN personnel stationed in Hawaii were sent home via the SS Lurline (Matson lines). It was one of the fastest luxury ships afloat at that time. My mother lived in a historic time period. 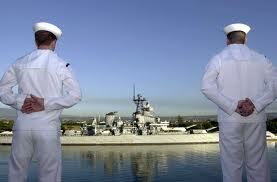 My father served with honor in the USN. 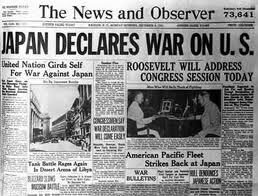 And my mother was there to help the war effort shortly after the Pearl Harbor attack. The photo I'm sending you is of my mother/father in front of the base housing where they lived in Honolulu, Hawaii, December, 1941 days before the attack. From Annie Marshall, Army vet and Army spouse. Her family has a rich history of military service, including Felix Marshall, survivor of the attacks on Pearl Harbor, and Peter B. Marshall, survivor of Japanese POW Camp. return from Japanese POW Camp. ... gotta love a man (and woman) in uniform! 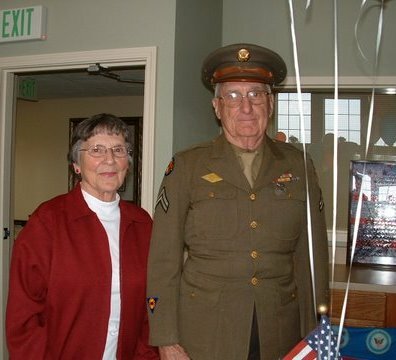 Margaret Mallory shares the story of her father's service, "Norman J. Brown joined the Army Air Corps when he turned 18 in 1943. 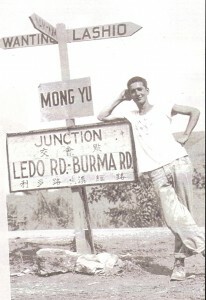 As a member of the 69th Depot Repair Squadron, 301st Air Depot Group, Norman drove a truck in a convoy over the Burma-Leda Road into China. His unit was disbanded at the end of the war and he was reassigned to the 1363 Military Policy Company in Shanghai, waiting to return home. Norman used his GI Bill to attend college – a prospect that he had not considered as a farm boy before the war. 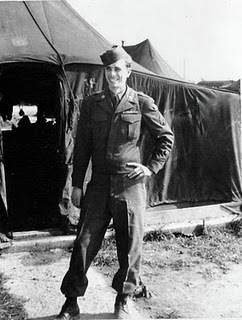 The military also whet his appetite for travel – he ultimately took his family to West Africa when he worked for USAID. Several years ago, he returned to China with his wife." Norman proudly wore his WWII army uniform for Veterans' Day! Pamela Clare shares about the loss to her family, "His name was Joe Connor, Uncle Joe to my mother. He'd just gotten married and had been away on leave the week before the bombing of Pearl Harbor for his honeymoon. As you probably know, the Utah, where he was stationed, was a training vessel and wasn't even with the other ships. So he was new to the Navy, too. From what I was able to glean from talking with survivors of the Utah, he was probably stationed down in the boiler room, where, as I understand it, men sacrificed their lives, trying to keep the boiler from blowing so that others could get off the ship. He had one week of marriage, and then he was dead." The USS Utah was moored on the west side of Ford Island. Since Ford Island is not open to the public, few tourists visit the site (but a tour bus visits the USS Missouri on the east side). The USS Utah is often called "the forgotten memorial" but I always take visitors to see it the ship as is lays on its side in eternal rest. 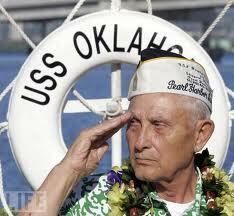 Mahalo to the veterans and authors who contributed to today's post. We salute your family's service. 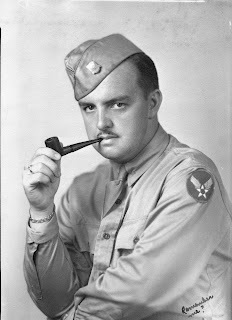 I invite our readers to comment about the veterans in your family. Kim: You both write for Harlequin on opposite sides of the pond. What was the path you took to become a published author? Nicola: I started writing romance when I was about 18 and over the years sent in several manuscripts to Harlequin Mills & Boon. I loved their historical imprint and couldn’t get enough of the books so I thought I would try writing one of my own. They rejected me three times, though, saying that there was too much adventure in my stories and not enough romance. I was determined to keep trying and eventually after 12 years they accepted True Colours, my first book. Kim: You both wrote in your bios that you have "menagerie of cats and dogs". Do you incorporate pets into your stories? Nicola: Yes, we’re both pet-lovers! I like to include pets in my books sometimes. Whisper of Scandal, the first in my current trilogy, features the most adorable Dandie Dinmont terrier called Max. He was based on my aunt’s pet dog, Becky, who sadly passed away a month ago. I like to think of Max’s character as a little tribute to Becky. She was a feisty little creature full of spirit and fun! Amanda/Laurel: LOL! I think the pets would like it if I had pets in every story. I do sometimes write them into plots. In my novella in The Diamonds of Welbourne Manor (Charlotte and the Wicked Lord) Charlotte has two Pugs, Oliver and Octavia, based on my own Pug Victoria. I had so much fun with that! 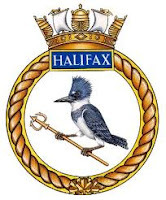 Kim: Nicola wrote, "Genealogy is one of her passions and she has traced her family tree back to the sixteenth century by way of various poets, pirates and a link to the Earldom of Halifax." Could you share an ancestor's poem? Or a great uncle's seafaring adventures? Do any of your ancestors appear in your books, even if by a different name? Nicole: I don’t have any of my grandfather’s poems, sadly. He was a very private person and destroyed a lot of his writing but I like to think that I inherited his love of writing even though I am hopeless at poetry and admire hugely anyone who can write it. My husband’s family is the one with the pirates; two Cornick ancestors were pirates in the 18th century and were captured, tried and sent to Australia. Their Cornick descendants live there still. I think I am very lucky to have been able to research such a fascinating family tree. I recently learned that on my father’s side I am descended from Princess Nest of Wales. That thrilled me! Kim: Amanda, any interesting characters in your family tree? Do you use your family (or friends) to inspire characters in your books? Amanda/Laurel: I guess I do in that I like to watch and listen to people, and that helps me envision my own characters and write their dialogue in what I hope is a believable way. There's a family legend that an ancestor escaped from Ireland after the 1798 Uprising and made his way from Canada to the US, but I haven't been able to find confirmation of that! I definitely use stories I heard growing up about Ireland. Kim: Nicola has "lived" and studied history in England. Do you still research for your books? Nicola: All the time! Historical research is one of my favourite things. I love turning up little snippets of information and historical facts that inspire my writing. Kim: According to Amanda's bio, she wrote her first book during algebra class. Hmmm .... how do you conduct your research for your UK set books when you live in America? Amanda/Laurel: I'm a research book-buying addict! I can't stop, even as my house fills with tottering piles of books. I especially buy books about history, particularly the UK and France. Researching aspects of history for my novels is one of my favorite things. 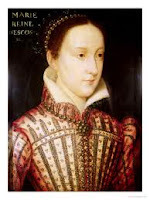 (My next Harlequin Historical is set at the court of Mary Queen of Scots, so I'm deep into that era right now!). I also like to travel whenever possible and gather inspiration. Kim: Nicola volunteers at the Ashdown House with the National Trust. Tell us about it. Nicola: I work as a guide and a historian, showing visitors around the 17th century house and telling them something of its history. It’s an awe-inspiring place to work, so beautiful and rich in history. We learn a lot from our visitors as well; they are often experts in art or architecture, fashion or jewellery. A lady came to visit a few months ago who was a lace-maker and was able to tell us all about the lace collars and sleeves in the portraits. It’s fascinating. Kim: Amanda, what is your favorite place in England? Amanda/Laurel: That is such a hard question! I've loved everyplace I've been. One place I enjoy a lot is Bath, it just "feels" so very Regency! As Nicola knows, because she shares my Anne Boleyn fan-dom, I also love everyplace associated with the Tudors. And I could live in the British Museum! 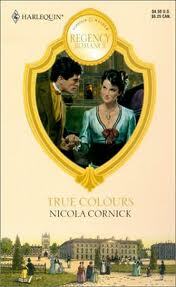 Kim: Nicola is a Word Wench and Amanda is a Risky Regency. I read them both every morning! How did you become a member of these group blogs? 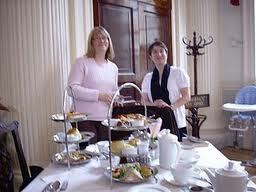 Nicola: I’m so pleased you enjoy them, Kim! It was the lovely Anne Gracie who invited me to join the Word Wenches. I was hugely flattered and not a little in awe because I knew that alongside Risky Regencies, Word Wenches was one of the most influential history and writing blogs around. The other Wenches welcomed me with their characteristic charm and I absolutely love being a part of the blog. We’re all history nerds and it’s always fun to chat with like-minded people! Amanda/Laurel: I can't even remember for sure! A few years ago at an RWA conference, I was having margaritas in the hotel bar with Megan Frampton and Elena Greene, two of the other founding Riskies. We then went to eat mashed potatoes (as you do after drinking margaritas!) and decided we needed a forum to share our love of history and books and crazy things like fashion and good-looking actors. Voila, a blog! It's been a wonderful journey. Kim: Tell us about your current series and upcoming books. Nicola: The Scandalous Women of the Ton is a six part series featuring heroines who break societies rules in various ways. Joanna, the heroine of Whisper of Scandal, outrages the ton when she decides to travel to far-flung places. In One Wicked Sin, Lottie is cast out because of her scandalous love life and in the new book, Mistress by Midnight, Merryn actually works for a living, something that was considered beyond the pale! I wanted to show the many and different ways that women could be scandalous in the Regency period – and that it takes a very special hero to match such feisty heroines. Amanda/Laurel: The Daughters of Erin is my debut series as Laurel McKee! It's about the 3 Blacknall sisters of Dublin and their hunky heroes, set around the tumultuous history of Ireland. And Duchess of Sin is book two, Anna's story as she finds her dangerous, dark Irish duke (and gets into a lot of mischief in the bargain!). I had so much fun with this story, as it's set at Christmas. And nothing is more fun than an Irish Christmas! Kim: What's next for Nicola, Amanda, and Laurel? Nicola: I’m currently working on book 4 in the Scandalous Women of the Ton series. It’s out in August 2011, it’s called Notorious and it features a heroine who breaks hearts for a living! Amanda/Laurel: Book 3, Lady of Seduction, will be out in June 2011! 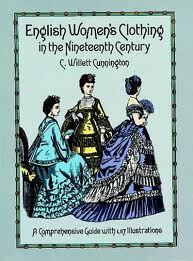 It's the bluestocking Caroline's story, and I loved her so much. We also meet her hero on Duchess of Sin, though he's not very heroic in that story (I always love a villain-into-hero tale). 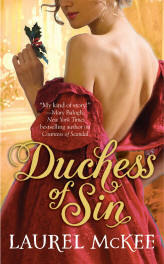 And Amanda's next book is out in March 2011, The Shy Duchess (duchesses are everywhere lately!) For more information, excerpts, and a fun contest, you can visit my website at http://www.laurelmckee.net/. Nicola and Amanda also have Christmas anthologies available! For more information, including excerpts, check out Nicola's website and Amanda's website. - Laurel McKee's COUNTESS OF SCANDAL and DUCHESS OF SIN. - Nicola Cornick's MISTRESS BY MIDNIGHT. Mary posted reviews of Nicola's and Laurel's books on her website. 1. Leave a comment about Nicola, Amanda/Laurel, and your favorite historical place in England. 3. The giveaway is open only to US and Canadian readers. Comments are open through December 9 for the book giveaway. 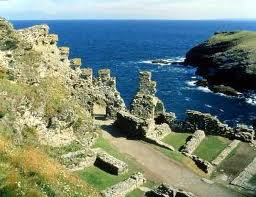 ... Tintagel Castle hugging the Cornish coast. Actually, its two parts on separate cliffs with many steps connecting them. It is called "King Arthur's Castle" and it even has "Merlin's steps" leading down to a seaside cave. Check it out for yourself at English Heritage. - USS Utah: At 0801, the Utah took a torpedo forward and immediately started to list to port. Six officers and 52 men died from the attack. 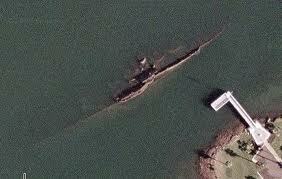 Her partially submerged hulk still remains, rusting, near her original mooring. Beneath the waters of Pearl Harbor, 58 sailors, who died when the USS Utah was sunk by Japanese fighter planes on Dec. 7, 1941, silently guard the remains of a shipmate: the ashes of a baby girl. Chief Yeoman Albert Thomas Dewitt Wagner had been waiting for a chaplain to be assigned to the Utah, hoping for a proper burial ceremony at sea for his daughter when the Utah went out on maneuvers. An urn carrying her ashes was in his locker in the Utah's chief's quarters. But the surprise attack changed everything. Wagner was among those who survived the bombs that day, but he was not able to rescue his baby's ashes. In retrospect, "I don't think there is a better tribute to my twin sister than to have all those wonderful and brave men guarding her," Mrs. Kreigh said during a telephone interview from her home in California. The Navy has given permission for Mrs. Kreigh, the surviving twin sister, to be interned in the USS Utah when she passes from this earth. 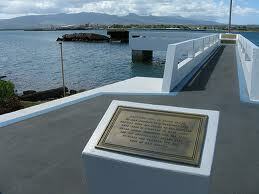 the USS Utah is often the "forgotten memorial". 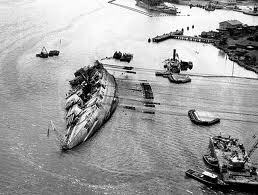 - USS Oklahoma: Moored near the USS Arizona, the Oklahoma took three torpedo hits. Within 12 minutes, she had rolled over. 429 officers and enlisted men were killed or missing. The ship was raised, but she never saw action again. The USS Oklahoma Memorial remembers the men who died aboard the ship. The USS Oklahmoha Memorial is located at the entrance to the USS Missouri, overlooking the USS Arizona from Ford Island. 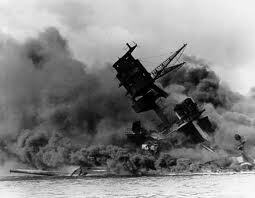 - USS Arizona: At 08:06, a Japanese bomb hit the port side of the Arizona. 1,177 lives were lost, over half of the casualties suffered by the entire fleet in the attack. 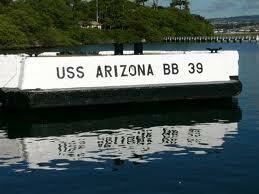 The Arizona remains “moored” off Ford Island as a memorial to her crew. The ship leaks about a quart per day into the harbor. Survivors from the crew say that the oil will continue to leak until the last survivor dies. 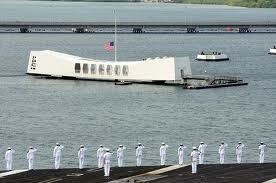 The USS Arizona Memorial is operated by the National Park Service. 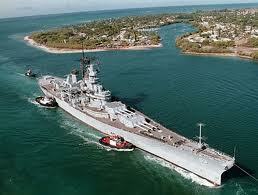 Elvis donated the proceeds of his 1961 Honolulu concert to the USS Arizona Memorial Fund. The USS Arizona Memorial was constructed at Pearl Harbor in 1962 and was designed by Alfred Peris, a prominent local architect of Austrian decent who fled from Germany to Hawaii. After the bombing of Pearl Harbor Peris was arrested and interned at the Sand Island Detention Center interment camp during the first two years of WWII. In designing the memorial Alfred Peris made sure that no part of the memorial touched or was affixed in any way to the USS Arizona. The average age of the men who died on the USS Arizona was 19 and the names of all 1,177 men who were killed on the Arizona during the attack on Pearl Harbor are listed on the memorial. 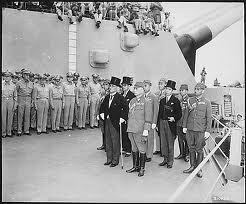 - USS Missouri: The “Mighty Mo” witnessed the end of World War II when the Japanese military surrendered on her decks in Tokyo Bay. 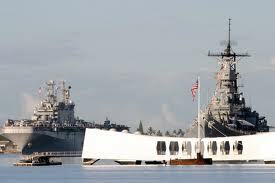 The Mighty Mo is now a floating museum next to the Oklahoma Memorial. 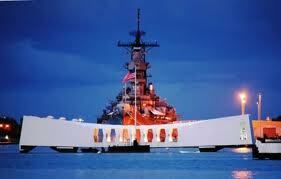 Her bow faces the Arizona as a solemn sentry so those interred within Arizona's hull may rest in peace. Last week, the bridge to Ford Island was temporarily closed for the Navy to practise its annual Pass and Review to honor December 7. I share pictures from previous ceremonies.